On the LHR-JFK route (where I have found good availability in Economy), it costs an extra 10,000 miles return to use Delta metal over the VS metal, however, the fees and charges are £100 lower (£161 return). Forgot to say, whilst availability in economy on this route was good, in other cabins it was a bit more sketchy. There was still availability but not for every flight. When will we know what changes are afoot with the BA cards? I’m about to get a new credit card to collect avios or FC miles, and a loss of the BA 2-4-1 voucher or restrictions would steer me towards contuing with the Virgin miles collection. I’m like many readers – don’t fly enough for status, collect a fair number of miles through other means, but not rapidly enough for a yearly full miles redemption in UC or CW for myself and my wife. Much as I would love to do a 2-4-1 return in UC or CW as I do like a flat bed on a 6+ hours flight, I think i could do a premium economy day flight and return overnight with a bed which would make the Virgin offer work for me, but would prefer a full BA 2-4-1 for obvious reasons! Although having just checked the ‘will you be accepted’ process looks like Virgin won’t accept me anyway!! What would be handy is some examples a comparion of how many Avios vs FC miles would cost for some routes. I was in JNB last week, and a one way flight redemption back to London in premium economy was 32.5k miles with Virgin, and 50k with the (inferior) BA. Taxes roughly the same. You can guess which one was booked! The fact that both airlines now have peak and off-peak calendars, which don’t match up, makes that a bit messy. I would have done it otherwise. no real option as you will need to get the 200 TP tickets. So mostly all fare class I and up. one return fling in UC at that fare class will give you silver. you will need 2 UC returns at fare class I or above + one one way to get gold. I think their partner earnings (even if code share) are dramatically lower but I have nt looked at the details there. Plus gold in FC is useless from partner benefits etc. its great if your routes are covered by VS, but otherwise its rubbish. Cause they premium eco is very good . so US outbound in PE and return on night flight in flat bed with clubhouse access both ways is a good overall proposition. For people who are happy with flying economy occasionally I find Virgin is good value flying upper one way and economy the other. For example, off-peak LHR-DEL costs 37500 miles one way plus around £350 in taxes, but if you add an extra 10000 miles and £50 in taxes you can add a return in economy. I have my credit cards registered with Virgin rewards, don’t really think about it or shop anywhere on purpose but I have earned a few thousand miles just because. Can I ask who you directed your complaint to? Was it just the general contact or someone specific ? Getting near to the stage myself where I can’t be bothered with them! ANZ and Singapore are not bookable from the UK in practice but they can be booked for regional travel. I’ve said this on other threads yesterday but this has not been my experience with all US and Hong Kong flights. I always fly economy but find that the taxes are too steep for longhaul so just focus on ba RFS in europe for redemptions. I have flown to the states various times for roughly the same amount you would pay in taxes so even with 100 pounds less in tax I dont see the real benefit. There are 2 x J seats every flight , every day so I fail the see the logic in the “lac of availability” argument. If you plan ahead and book early you will pretty much be guaranteed ( with the odd exception for real busy routed ) to get the seats you want. If you want 2 x J the Maldives or Sidney over Xmas and look 90 days before its not going to be possible I grant you but the early bird has already caught that worm. There were seats on those flights , you just started looking after they had gone. I mean that’s a bit ridiculous, especially on shorthaul flights. Some European routes have weekend flights available only for 6 months from now, but it’s crazy to pretend that people should book so much in advance for such a close trip. There should be for seats available, that’s all. I’m personally fed up with BA and plan to move to Virgin Miles hoping that the merger with AF/Delta programs happens as soon as possible. Flew J to BKK and F back from HKG last year in school holidays, booking at T-355. The seats are there if you’re willing to plan ahead. Don’t have status with Virgin but husband and I put £50000 a year each through Curve re Inland Revenue payments so extra 50000 miles a year on this card. Also will gain from many purchases from small suppliers do not take Amex and am forced to use Visa. Works for us !! Can Curve be used to pay another credit card bill? For instance, can I pay my Amex bill with a Curve linked to a Lloyds Avios card? They are clamping down, it was possible but they are blocking such sites as they come up. So I imagine as well that we cannot use the Virgin MasterCard to pay the Amex bill? Is there a reason to use this card via curve and not directly for the Hmrc payments? You can’t use a credit card for HMRC any longer, hence Curve. A few people are talking about BA following suit with status, so Blue for Economy, Bronze for PE, Silver CW and Gold for First. The savvy amongst us would do one Business Qatar Ex EU and a couple of Economy BA flights. BA would be shooting themselves in the foot if they followed. This makes no real sense. BA WANTS you to redeem in F. Take Atlanta – as someone raised on Flyertalk this week, there is a 14-seat F cabin going out to Atlanta every day, to a city with no real premium employers. Making it harder to ‘sell’ those seats for 150,000 Avios by restricting access to stupid. Doesn’t mean it won’t happen, but it is stupid. Those carriers that DO restrict F access actually make it a marketing benefit – ‘our cabin is SO exclusive you can’t even redeem for it [unless you are top tier, use our programme and not a partner etc]’. Air France, Swiss, Lufty can get away with that. People would laugh if BA started talking about F like this. generally what most airlines usually do around miles is stupid. well, at least from the customer point of view! Love four article Friday’s ???? Sorry if I missed it, but who won the ‘choose your own carrier’ premium economy flight to NY? The sponsoring airline sent us a random number today (bit slow of them), we picked that number entrant and Anika is awaiting email confirmation from them. Once that is done we will announce it. The winner is in the 65+ demographic. I’ve not done something this detailed for years, mostly because the loyalty market for UK rail is so depressingly dull. There’s a nice (up to 4x) bonus offer for Apple products at the moment. I currently have the MBNA Black and White cards. I used to earn 2 x PE Upgrade vouchers per year but now just one as I switched some spend to the Lloyds Avios card. Having to spend £10k instead of £5k for the PE voucher is a real stretch when £7k on Lloyd’s can get me a CW voucher. I haven’t had Gold with Virgin since the Little Red bonus point runs. 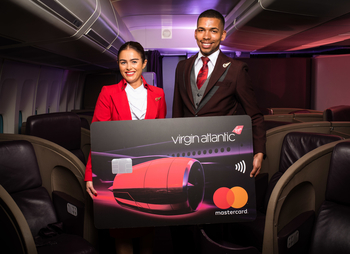 Even doing several Virgin flights getting status seems unlikely, as with the vouchers at least one or two will be reward flights eg no tier points. Given you can sometimes pay in to the Clubhouse for £60, a voucher for ONE for that as a choice versus a 20k mileage savings seems poor. So all in all, I’ll probably dump the Virgin cards, although a one off sign up bonus is tempting. Seems no one has mentioned the “best value redemption” yet,which is of course First Class from Heathrow to Beijing with Air China for just 37,500 miles each way. The IFE is dire but it is leaps and bounds above BA Business seating, and a great positioning flight for Asia then a return one way from HK. Rob mentioned the Beijing option in response to one of my queries on another of the Virgin cards articles. But definitely no harm in raising it again. We are running a review of the Beijing flight next week. I was hopeful for these cards but the restriction to higher redemptions has made it a non-starter for us. We’ve spent over a million avios over the last decade since we began collecting, always in J and F to Asia, and I was bronze maybe once in that time from a work trip. I’ve been collecting Virgin miles as a backup for BA and did a solo PE and upper class to NYC which I really enjoyed. I have about 70k Virgin miles left I was hoping to pair with a 241 to take the OH in Upper class but will have to make other plans for them . I have the free MBNA cards and will probably get the new free cards but unlikely to target the vouchers.